Auctioneer Rick Schmidt (center) plies his trade at the old Bay City Branch Library, coaxing more than $20,000 out of buyers for purchase of furnishings. Rick Schmidt didn't need Abraham Lincoln to rake in over $20,000 from the sale of furnishings from the old Bay City Main Branch Library. The auction on Saturday was the last public event in the 74-year history of the old Carnegie Library. When next we enter the building it will doubtless be for the grand opening of a remodeled Thumb National Bank. Bay City thus will have preserved one of the state's most classical examples of Greek Revival architecture in the financial services field. Mr. Schmidt exercised his vocal chords to good effect for about four hours Saturday, from 11 a.m. to about 3 p.m., about three hours and 58 minutes longer than it took Lincoln to deliver the immortal Gettysburg Address. 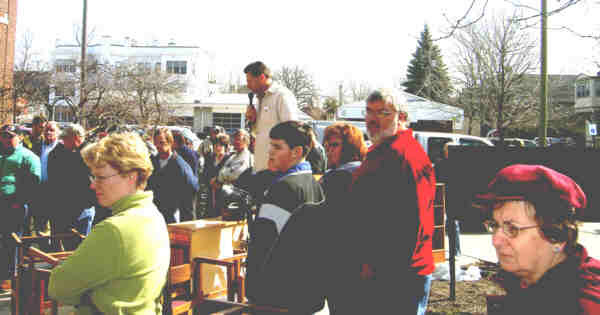 The auctioneer sold just about everything to more than 200 anxious buyers, except a 1913 painting of Honest Abe, a computer desk and an old printer. "The Lincoln painting went to the new library but almost everything else went out the door," said Mr. Schmidt, still breathless over his verbal exertions. Some items remain in the building awaiting pickup from their new owners who were successful bidders. Operator of "The Finest" Auction Company, with headquarters at Third and Saginaw streets, Mr. Schmidt said he does "lots of benefit auctions" among the two dozen or more he conducts each year. Most amazing sale of the day was a marvelous book case, about 36-foot long and four foot high. The oak and frosted glass book case surrounded a downstairs room on three sides. The sale price? An unbelievable $4,000. "It's gorgeous," the auctioneer exclaimed. "The woman who bought it is building a new house. My wife wanted me to buy it and I was prepared to go up to $2,000," said Mr. Schmidt. A set of more than 200 Harper's Magazines dating from Vol. 1, No. 1 in 1850 to current years went for a total of about $1,500, said Mr. Schmidt. Some of the items sold were truly historic, one table at least dating to the 1874 establishment of the Bay City Public Library by the Bay City Library Association and the Bay City Board of Education. Oak library tables went for twice the estimated price of $150, said Mr. Schmidt. Some ornate chairs went for up to $160. "The sale really did well, far exceeding what I thought it would do," he added. He credited pre-sale publicity from The Bay City Times, Jay Brandow of TV-5 and WSGW Radio for getting the word out about the auction. The east side public library was located in City Hall on the second and third floors from 1898 until 1922. Land at Center and Jackson for the new library was donated by tycoons and civic leaders H.B. Smith, C.R. Wells, James E. Davidson and W.L. Clements. The Bay City Branch Library was established alongwith thousands like it across the nation through the generosity of steel magnate Andrew Carnegie and the foresight of community leaders and voters. One source says a $25,000 bond issue was approved by voters and the new library was opened Sept. 1, 1922. Marv Kuzmierz on Bay-Journal reports that $31,000 in local funds was contributed along with a $35,000 Carnegie Foundation grant to build the main library. Of the 2,811 libraries Andrew Carnegie helped construct throughout the English-speaking world, only five libraries were actually endowed; the home communities of these libraries were not required to publicly subsidize their libraries (although, such subsidy was encouraged). All other towns which received a library gift from Andrew Carnegie were required to subsidize their library by an annual amount that, at least, equalled ten-percent of the cost of the library building, an arrangement soon dubbed "The Carnegie Formula." The Bay County Library Board was established by the County Board of Supervisors on April 16, 1957 in order to furnish free library services to the entire county. A large share of the cost of the library system was planned to be from penal fines.